It has been exactly one year and three days since I wrote my first blog post and shared the first recipe with you. 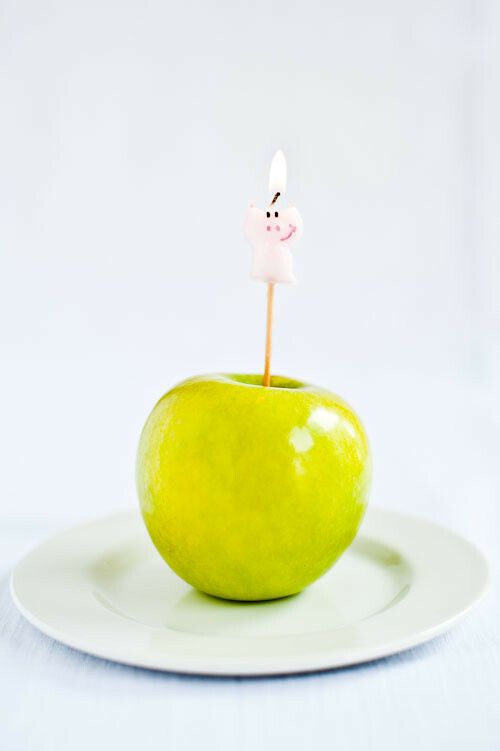 I can hardly believe that my beloved blog is now one year old! Since then, my life has changed so much. This blog has introduced me to a whole new world of cooking and photography. I had no idea how many wonderful friends I would meet and how much I would learn. I could have never imagined how fantastic the food blogosphere is. I still feel like Alice in Wonderland! 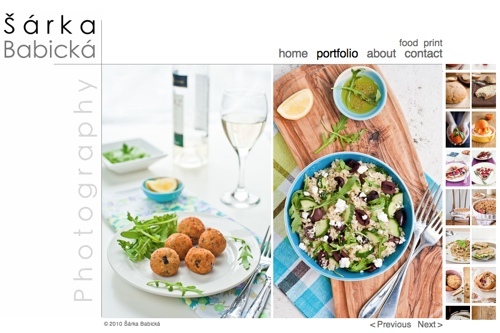 It may sounds unbelievable, but I had never been interested in either photography or cooking before I started my blog. Yeah, that is true. I'm not that kind of photographer who first picked up a camera at some very young age. And I think that doesn't make my photography passion less serious. Cook Your Dream was born shortly after I discovered I actually enjoyed cooking. I didn't used to cook because I didn't have to, as P. is a fantastic cook and he always liked cooking a lot. Things have changed when we moved to London two years ago. Many exotic ingredients available almost on our doorstep brought a whole new dimension to cooking for me. I have suddenly started enjoying experimenting with new flavours and dishes. The more I cooked and baked, the more I wanted to share my new passion. One day when I baked my first apple crumble I decided I had to share the recipe. I was thinking my mom and friends would love it (sharing my recipes with them was the original purpose of my blog, and I was absolutely thrilled when I got my first comment after two months). The crumble was so delicious and beautiful in my eyes that I asked P. to take a picture of it (I didn't give him credit for the photo as I had no idea I should do so at that time, although all the photos in the first three posts were taken by him). Well, I had the recipe and photos, but I had no blog to share them. Once again I asked P. for help, and a couple of days later my first blog ever was born. I was so excited! I cooked and baked and P. took pictures of my creations. What a great team I thought. It worked perfectly, not for long though. After a month, P. refused to take more food photos and said I should try it myself. I wasn't very happy but I had no other option as I needed photos for my blog. I had to ask him to explain the basics of his dSLR to me. I'm very impatient student, but I really tried to soak up everything he was saying. It has opened up a whole new world for me. I always loved cookbooks and food magazines with beautiful photos but I never thought I would enjoy taking food photos myself. However, after a couple of days of studying, reading and trying, I completely fell in love with food photography and styling. I knew I found my real passion in life. It's been nearly one year since I took my first food photo and I can't stop learning, taking more photos and loving everything about food photography and food styling. I launched my food photography portfolio website two months ago, and last week I got my first photography job in London! Words can't describe how happy and excited I am. If someone had told me one year ago that I would get my own dSLR camera and would love photography so much, I would have just laughed (I got my own point and shoot camera for Christmas in the same year I started this blog, because I didn't want to use P.'s dSLR camera). 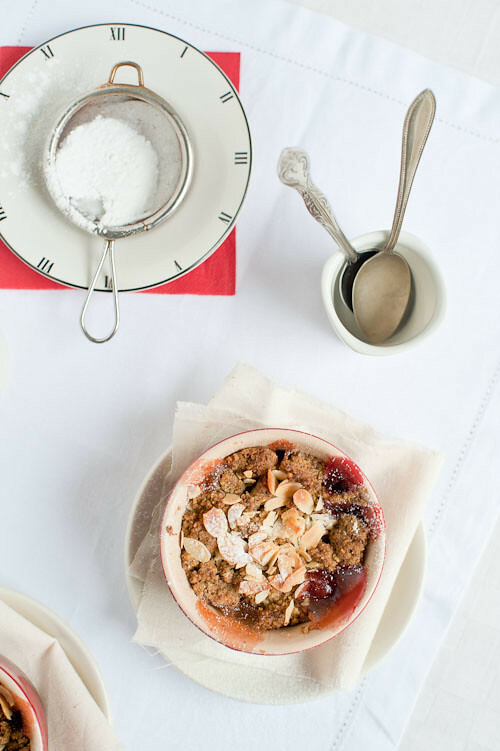 As it was the crumble that actually made me start this blog I thought I would share yet another crumble recipe in my anniversary blog post. 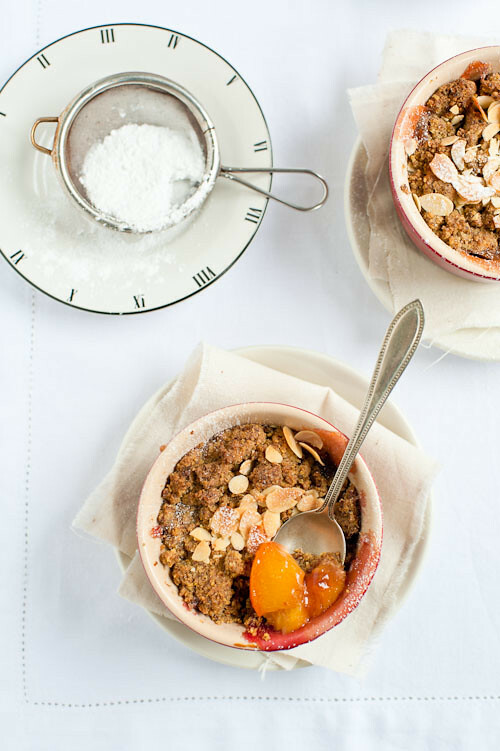 I have experimented with various fruit fillings and crumble toppings during the year and my last favourite version is peach crumble with buckwheat topping. I added some flaxseed from Linwoods in this recipe to create even healthier and tastier version. One of the most important and fantastic things this past year has brought me are all my blog friends and readers. I had a chance to meet some of them personally and they became my real friends, and for that I'm very happy and grateful. I want to take this opportunity to thank all of my readers and I decided to give something away. 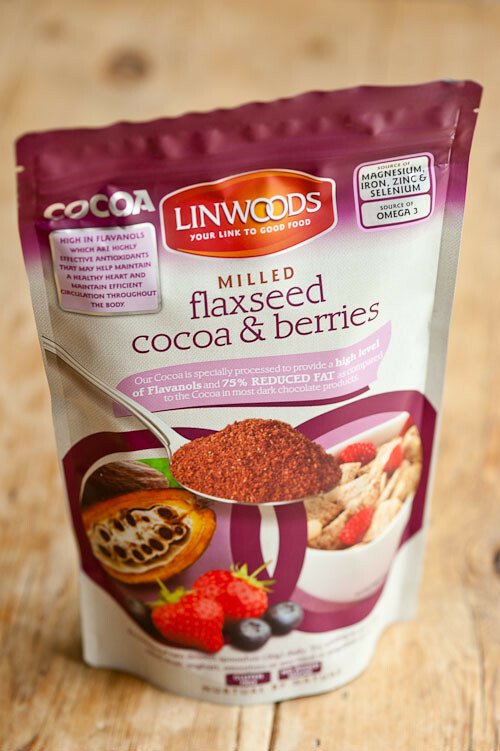 I won a Linwoods Cocoa Delight Recipe Development competition recently with my Buckwheat and Flaxseed Berry Crepes recipe and photos and I would like to give one reader a bag of Linwoods Milled Flaxseeds, Cocoa & Berries so you can make my crepes recipe or develop your own new recipe. This giveaway is open internationally. Entering to win is very easy. Just leave a comment on this post before noon (12:00) on next Thursday the 26th August (GMT). I will randomly select one winner on Thursday and contact them by email. Please make sure your comment links back to a site where I can contact you or leave your email address in your comment so I can contact you if you win. I have made slight changes in my blog design to celebrate the anniversary. I've created new navigation menu placed under my logo and most importantly, I have finally added an About page! I also created a Facebook fan page for Cook Your Dream recently. Head over there now and become a fan if you don't want to miss another giveaway which is coming soon! 1. Preheat the oven to 180C and butter 4 ramekins. 2. In a medium bowl mix the flour, flaxseed, sugar and salt. Add the butter and rub in with your fingertips until the mixture resembles breadcrumbs. Gather the mixture into a ball and place in the freezer for about 10 minutes. 3. 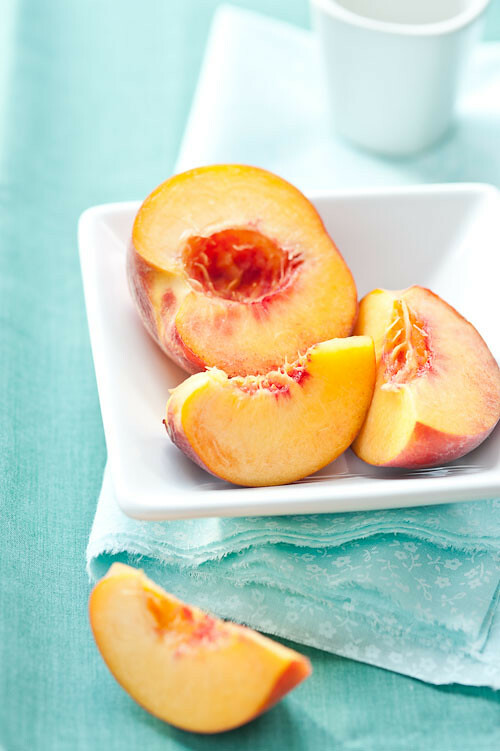 Mix together sugar, lime juice, zest, vanilla and cornstarch in a large bowl, add the peaches, and toss until evenly coated. 4. 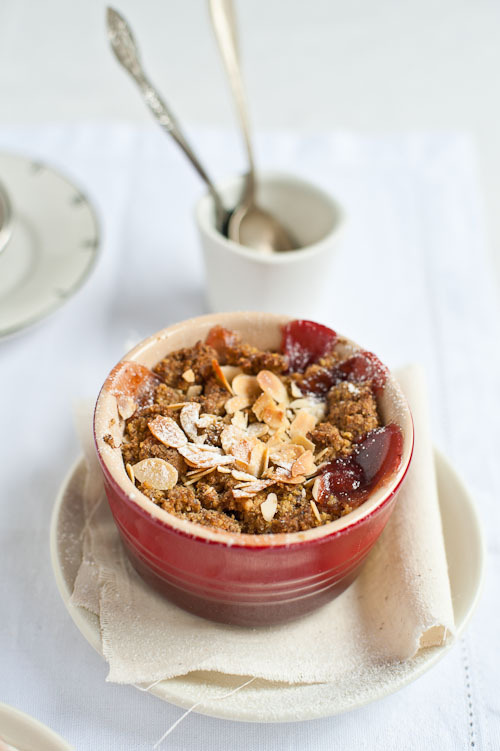 Place the fruit mixture in the prepared ramekins and sprinkle the crumble filling over the top. Top with sliced almonds. 5. Bake for 30-40 minutes, or until the crumble mixture is golden brown and the fruit filling is bubbling. 6. Let it cool down for at least 15 minutes before serving.